The legendary Castlevania: Symphony of the Night will be ported to the iPhone as a ... puzzle game? Here's the good news, everybody: Castlevania: Symphony of the Night, the beloved PS1 action-adventure, will be ported to the iPhone platform. SotN is one of the most fondly-revered games of all time, so this is a good thing, right? Now, here's the weird news: Konami is turning Symphony into - of all things - a puzzle game called Castlevania Puzzle: Encore of the Night. 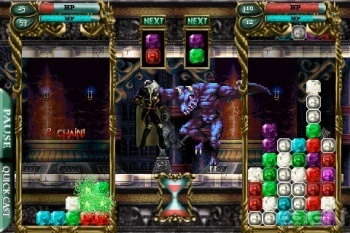 From what IGN has to say, it seems almost identical to the transformation Street Fighter went under as it became Puzzle Fighter: Colored blocks fall from the screen, you try to line them up into groups of three or more, and when you make a match they fall onto your opponent's half of the playing field. As with Symphony of the Night, you'll be able to equip your chosen warrior with gear and weapons, like "swords that intensify the damage done by matches" or magical spells. So, it sounds like a match-up between Castlevania, Puzzle Fighter, and Puzzle Quest, then. Given that all three of those were (and are) awesome, one can only hope that Castlevania Puzzle will follow suit. Raise your hand if you saw this one coming. Now lower that hand and smack yourself, because you are a liar.